This month, the Department of Environment and Natural Resources [DENR] successfully repatriated 4000 endemic Bermuda land snails to Bermuda. 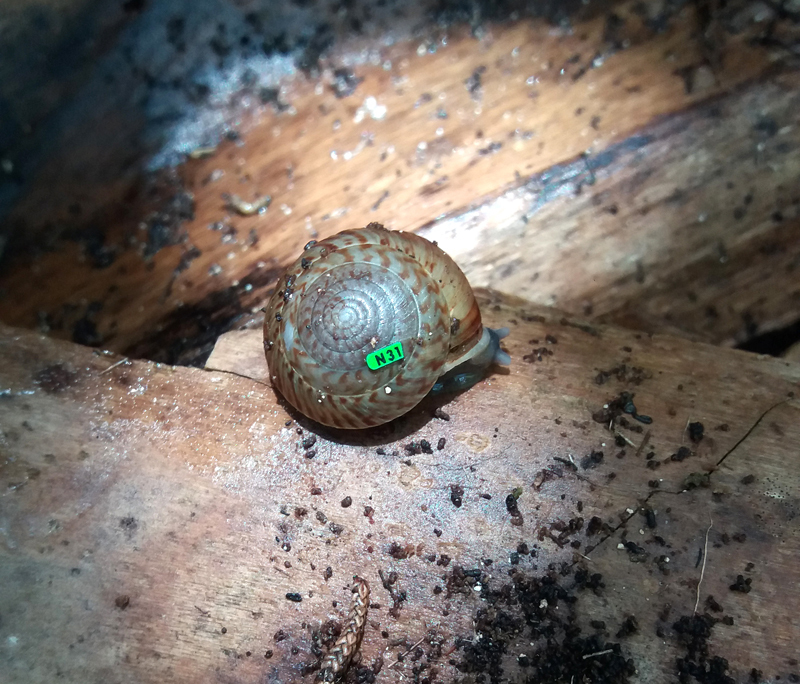 “The snails [Poecilozonites bermudensis] are currently being tagged and will then be released on Nonsuch Island and another, privately-owned island, as part of a monitoring project that will study how well the population fares post-release,” a spokesperson explained. “The snails came from a joint breeding effort by the Zoological Society of London and the Chester Zoo. The endemic land snails were sent to the Zoological Society of London shortly after their rediscovery in 2014. The captive breeding efforts at the Zoological Society of London produced so many snails — thousands — that they gave some to the Chester Zoo. These look like the snail shells found fossilized in limestone , never seen a living example. They probably won’t fare well against the incessant application of rodeo and round-up products on mainland Bermuda nowadays unfortunately. That’s because they ARE the same thing . Long thought extinct very small colonies were discovered in the last 20 or so years . One supposedly in the Horseshoe Beach area . Another eagle eyed local amazingly stumbled on a tiny group on the ground level walkway of Walker’s Arcade a few years ago. The other fossilized shell on the South Shore cliffs is the West Indian Topshell , also eaten to extinction a few hundred years ago but bought back again by that national treasure David Wingate . Agreed, bring the crabs back! Don’t even see frogs hopping across the street much when its rainy anymore. Everything getting killed off. All we have now are rats and chickens. I don’t know whether it’s true or not but I was told that the herons were introduced to control the land crab population because they were making holes all over the golf courses . If so , they did too good of a job. Some people I know swear down that the herons are now seen on large lawns at night chasing/catching toads because they mistake them for crabs ! I’m not sure how I feel about these types of projects. I understand wanting to preserve nature and wanting to save endangered species, but ,in doing so aren’t we interfering with evolution? I don’t think it matters in this case how this snail species almost became extinct. What matters is that evolution selected this species to die out, possibly paving the way for a new species to evolve somewhere in the distant future. Only now we have decided to play god and save this species, possibly destroying the chances for the selected new species to ever evolve. Of course, I could be completely wrong and saving this species of snail may just work out to be the best thing to do. I’m just thinking out loud. Wondering if anyone else has considered that we may be tampering with evolution in a negative way by saving species that were naturally selected to go extinct. I take your point, but I guess it would depend on whether this was natural evolution or was somehow a result of human intervention. Yes, apparently, the article refers to introduced carnivorous snails and flatworms, so these little guys were doomed if it were not for the programme to save them. Well done to everyone who thinks even the littlest of creatures deserve a second chance! If naturists, like Dr. Outerbridge, were allowed to publish say once a month endemic species that he believes are extinct or near extinction, perhaps the public could be more on the look out for these little guys. You never know where they could be hiding! Thanks Kathy, but I think you meant to say ‘naturalist’. A ‘naturist’ is something a little different. lol. Is evolution an autonomous entity with a pre-set plan capable of selecting species to die out or evolve?